Lares is a town located (3.250 m above sea level), where we’ll start our walk and take our first break to enjoy its medicinal thermo-waters. This will definitely be a unique and unforgettable walk since we’ll inform you of the indigenous people of the areas communication and you will learn about their customs and lifestyles. The social assistance is appreciated in all its aspects. This walk is part of the Sacred Valley of the Incas, entering a path with the stunning scenery of mountains and lakes as Sihuirococha, Ancascocha, etc., with forests and valleys that are covered by the morning mists. We’ll pass by Quechua communities where the inhabitants use loom woven clothing, their fabrics are nuances that are at a high level of textiles. We will visit many places full of scenery heading to the village of Ollantaytambo and catch our train to the town of Machu Picchu. Early in the morning we will be leaving on a bus to the town of Lares. During the trip, we’ll pass by some archaeological sites and artisan markets in the Sacred Valley of the Incas. The Sacred Valley is one of the most fertile lands of South America, with the production of corn, symbolizing the Inca in Andean religion. Entering the province of Calca (2.940 m above sea level), where we ascend to Passage Lares (4,400 m). Then we climb through the town of Lares (3.250 m) to the medicinal hot springs (3,200 m). Here we will have a relaxing time in the pools that have a temperature between 28 ° C and 34 ° c. After lunch at the hot springs we’ll start walking up Wuaca Wasi (3,600 m), campsite. This day will be the most difficult, because of the geological fault line we’ll come to pass, like the Sipsay pass located at 4400 m, which will take us about 4 hours. While trekking, we’ll pass communities to observe the local Andeans and their lands and their rustic homes and full traditions. The farmers have a broad knowledge of natural farming techniques, and they wear old colorful textile work inspired by their gods and symbols of Andean religion, which are admired in a region such as Lares Valley. We continue with the trip down to the town of Patacancha (3,650 m), campsite. DAY 3: PATACANCHA – WILLOQ – PUMAMARCA – OLLANTAYTAMBO – AGUAS CALIENTES. DAY 4: AGUAS CALIENTES – MACHU PICCHU – CUSCO. 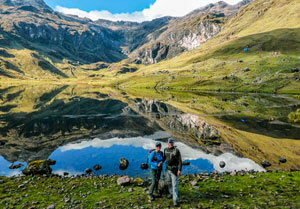 Private transportation from Hotel to Valley of Lares. Meals during the excursion (3 breakfasts, 3 lunches, 3 dinners / vegetarian option). Professional guide (English or Spanish). Admission to the hot springs of Lares Valley. Bus up and down Aguas Calientes to Machu Picchu. Hotel in the town of Aguas Calientes. Bus ticket down from Machupicchu to Aguas Calientes US$10 pp. 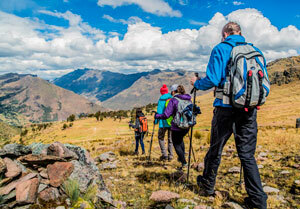 Optional Up-grade Vistadome train return to Cusco instead Expedition train US$ 40 extra per person.